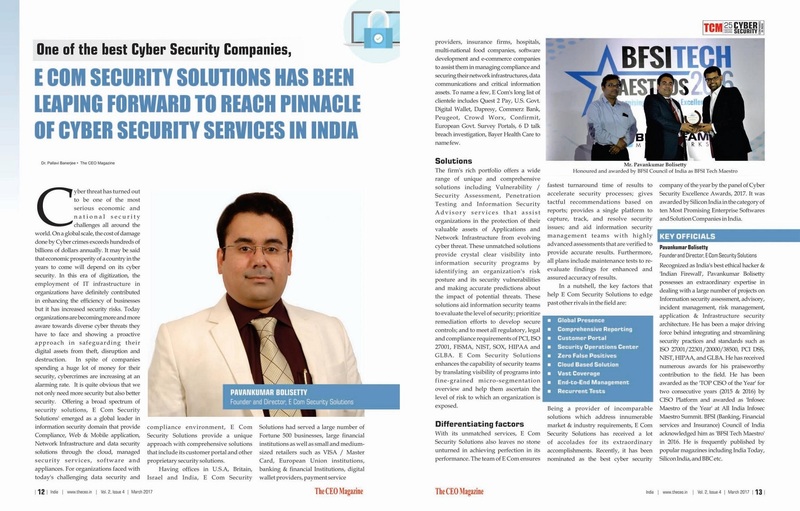 CEO Magazine has recognized E Com Security Solutions as the Best Cyber Security Company of the Year and featured in the March, 2017 Issue of CEO Magazine. E Com Security Solutions’ has successfully aided Organizations that range from Fortune 500 and large financial institutions to small and medium-sized retailers including VISA / Master Card, European Union institutions, banking & financial Institutions, digital wallet providers, payment service providers, insurance firms, hospitals, multi-national food companies, software development and e-commerce companies. E Com Security Solutions’ Cyber security research and Incident response team are staffed by experienced and well-trained security professionals that hold variety of security industry certifications including CISSP, CISA, CISM, GIAC, CEH etc. and have multiple years of real world information security experience by which they had leveraged to investigate and analyze moret than 5000 cyber security incidents. The global presence of data centers and satellite offices in seven countries had ensured low latency and fastest turnaround times for scanning the applications and network Infrastructure.